This year's Thunder over Michigan show is starting to shape up well with a number of aircraft announced already. Douglas C-47 "Hairless Joe"-Yankee Air Museum. Naval Aircraft Factory N3N-Bill Hirzel. wings of the north F4u-4 added. Commemorative Air Force FG-1D added. Up to 9 corsairs now!!! Brent Hisey's B-25 Super Rabbit has been added. the Liberty Aviation Museum's B-25J Mitchell "Georgie's Gal" added!! 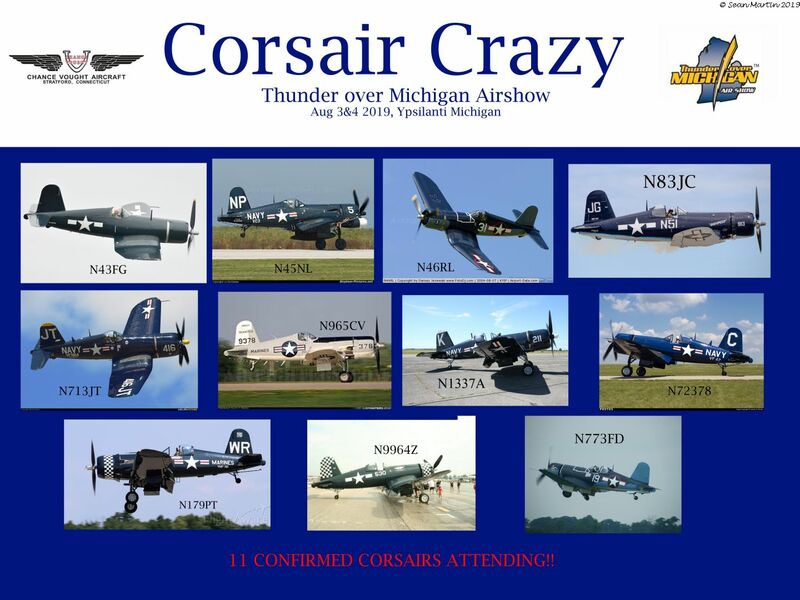 That is now 11 confirmed corsairs!!! First performers list added to website and first post updated here. Is the #57 racer still flying? I am told it is. As far as I know it was invited as well. BE interesting to see if it shows up!! 2 UH-1H's from the Army Aviation Heritage Foundation added...they usually sell rides and make a pass or two during the show. the Vintage Wings of Canada FG-1D Corsair added. That makes 12!! as well as a T-1 Jayhawk, E-6 Meercury, 4 T-6II and some other static aircraft.